You too has something to share! Send your funniest call center experience and email them at ngadingan@gmail.com. Since it's the holidays, and we should all be in good spirits (or at least trying to get there! 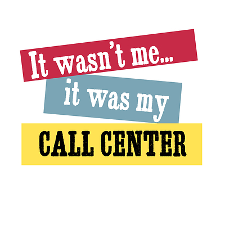 ), how about sharing your best/funniest call center story. Maybe John will pony up a prize for the best one (any more umbrellas left?). As a young supervisor in a hotel reservations call center in Texas several years ago, I was responsible for monitoring and coaching new hires during their first few months out of training. "And, sir, the room rate is 400 Frankfurters per night." "You mean we gotta pay them fellas in WEENIES?" By the way, she booked the reservation, was very accepting of my minor correction to her currency selection, and went on to have a very good career with the company. No word onhow the caller got that many hot dogs to Paris. side of the two wire circuit and ground (called "earth" in England). wire circuit for the conversation. d. Wet ground now conducted -- and the phone rang. 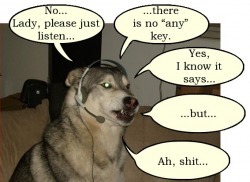 Not quite call centre but made me giggle. This is a friend of a friend of a friend story, so you can judge the authenticity. An old lady goes into a high street retailer to complain about a hairdryer she bought a week ago. She is wearing a hat. She takes off said hat to reveal a few strands of singed hair and a rather sore looking scalp. She then produces the offending article. Turns out is was a paintstripper but she had misread the packaging. The customer service person has major problems with empathy and sustains internal injury as a result of trying to keep a straight face. As a Team Manager, I was monitoring calls of some advisors online., sitting next to them! Now we had a Cellular Product, where we call customers on their mobile phones and promote some add on value added services. When he advised that he wanted to travel on 12th Dec 2026 I was a little stunned. I decided to take the logical approach. I apologised and calmly advised that the current timetables where only valid until September 2001. He advised that this was not acceptable. I tried to explain that timetables were seasonal and that they were produced by the current TOCs who could change by 2026. The customer then went on to advise me that he was in prision and needed to know that train times so that he could get to his son's birthday party when he got out. The customer then began laughing and said he was going to pass me to his coleague. His coleague then went on to thank me for being such as great sport and advised that I was live on Manchester radio!!! At the time this occurred, I was providing tech support for cable TV. With the increasing complexity of digital television, we would frequently receive calls from irate and frustrated senior citizens who would be completely confounded by their digital converter box. Usually it would take several minutes to calm the customer enough to assess the problem. I get a call from an extremely upset older gentlemen. In addition to being sputtering mad, he has a think eastern europe accent which was making him difficult to understand. All I could really pick out was that he wanted someone over there right away to fix the problem. I explained that, as it was 11pm, I could not possibly send a technician before the following morning. He insisted that he have someone there within fifteen minutes. I again explained the impossibility of that and offered to help him sort out the trouble. His response? "I tell you the trouble! Trouble is f*@king thing is overflowing! That is trouble!" Further inquiry revealed that he had a blocked toilet. He would not accept that his building superintentent had given him the number to his cable operator, not a plumber. After much discussion, he eventually hung up, presumably to call his building manager back. Five minutes later, the agent sitting next to me got him. Coax cable is generally connected to customers' homes via a grey plastic box on the side of the residence. This box contains the coax splitter and a ground connection and is locked to prevent cable theft. As with all electrical systems, bad things can happen. We received a call one night from a very angry customer who's cable tv was out. Smoke was coming from the box and it was very hot. he insisted that we send a tech immediately. We told him he needed to call the fire department. The customer refused, saying that it was our box and he was not going to run the risk of the fire department charging him to deal with our stuff. 45 minutes, an agent, a senior agent, and a supervisor later, with flames now flickering from the box, we finally convinced him to call the fire department and bill us if they charged him. Nature meeting high technology is always fun. Squirrels run along overhead coax and break the lines. Birds roost in the amplifiers. And, my personal favourite, a colony of bees decided that the neighbourhood cable node (large metal box on side of the street) would be the perfect place for their new hive... three years running!